Video Downloader for Facebook allows you to easily download videos very quickly from facebook with HD quality. 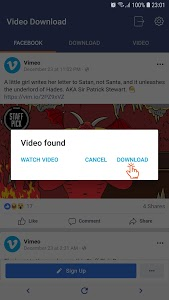 Video Downloader for Facebook can help you download and save videos from your Facebook news feed, groups, pages, friends, etc. Support downloading multiple files at once and arranging scientifically. 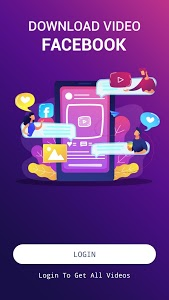 FB Vid Downloader is best fbdownloader without any hustle and with simple steps of clicking and download its best video downloader for android. 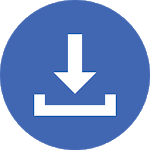 Install now it’s a fast video downloader. Must try now & download video from fb android. 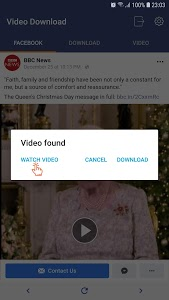 You can watch live videos and easily share videos to friends. - Click or selected Browse Facebook. - Login facebook with your account. - Click to play video you want. - Click "WATCH" to watch video live on your wall. - Click "DOWNLOAD" to download video. - Safe & light weight. 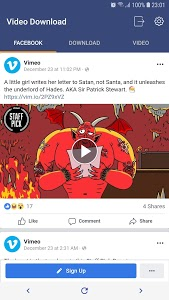 Similar to "HD Video Downloader for Facebook"